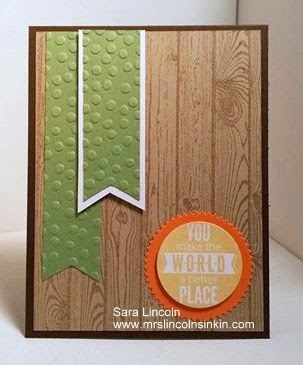 Hello all my stamping friends. 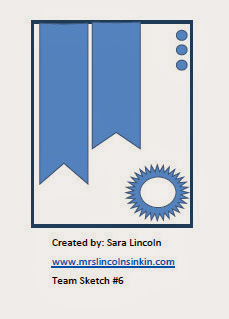 Welcome to Mrs. Lincolns Inkin'!! Now, another thing that this card has is some Sneak Peeks of items from the new Occasions Mini that is going to be out this January. OMG, I know before I said that this catalog was amazing, but now that I have actually been able to play with the new items I can honestly, 100% say it is SUPER AMAZING!!! I have had to pry myself away from my craft room. Now, like all the rest of the Sneak Peeks that I have done in the past, I can't give you all the details on the new items, all I can do is show you them in use. So let me point out a few things that are new that I used on this project. For one, the background stamp is new, secondly... the embossing folder that I used on my banners is new as well as the sentiment and the piece made out of pumpkin pie which is the bottom layer under my sentiment.